The Chicago 7 is a sewing, quilting and embroidery machine that is easy to use, thanks to its convenient arrangement of one-touch buttons. It is very versatile, whether using it for simple alterations, personalization, embellishments or sewing large projects. The wealth of features, including over one hundred fifty decorative stitches, twenty quilting stitches, two alphabets and one hundred built-in embroidery designs, give creative expression to your ideas. And thanks to the automatic one-step buttonhole and a simple threading system, all sewing projects can be accomplished quickly and easily. 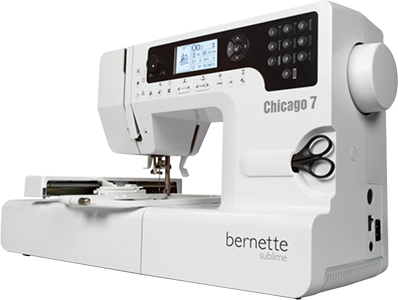 The Chicago 7 is compatible with the BERNINA CutWork Software and Accessory, giving you additional creative options, including eyelet embroidery, openwork designs and stamping. The bernette Chicago 7 will amaze you with its versatility. Length of freearm to the right of the needle: 6.5"
The London 5 is a mechanical sewing machine with a host of extras. Twenty-eight stitch patterns, including decorative, quilting and stretch stitches, as well as a one-step buttonhole, are easily selected via the pattern selector dial. Stitch patterns are listed in the flip-top lid and dust cover and the currently-selected pattern number is shown in the front LED display. The needle threader and two-level presser foot get you up and sewing quickly, while the stitch length, stitch width and needle position dials allow you to adjust the machine to the task at hand. Six presser feet are included to cover common sewing tasks and a large selection of additional feet, including a walking foot and a ¼" quilting foot, are available. You can even free-motion sew with the feed dog drop feature and an optional free-motion foot. A set of London-themed stickers are included for customizing your London 5. 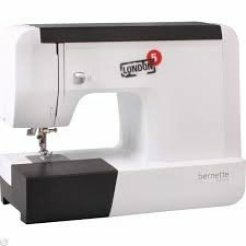 The bernette London 5 offers you an extensive array of creative possibilities. The recessed handwheel is readily accessible while being protected during transportation and storage. The Seville 46 is a mechanical sewing machine with a cool retro look. This value-priced machine includes eight stitches - six utility, a four-step button hole and a decorative scallop for when you want to give your projects a little embellishment. The stitch width is adjustable, giving you flexibility in your stitching. The solid metal chassis and powerful motor will handle your toughest sewing demands; it can even sew through six layers of denim! The built-in needle thread cutter, snap-on presser feet and automatic bobbin winder won’t slow you down either. 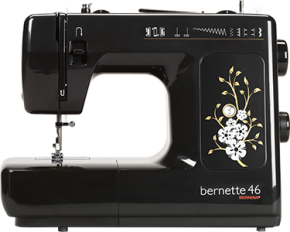 Let the bernette Seville 4 help you turn your sewing dreams into stitched projects!